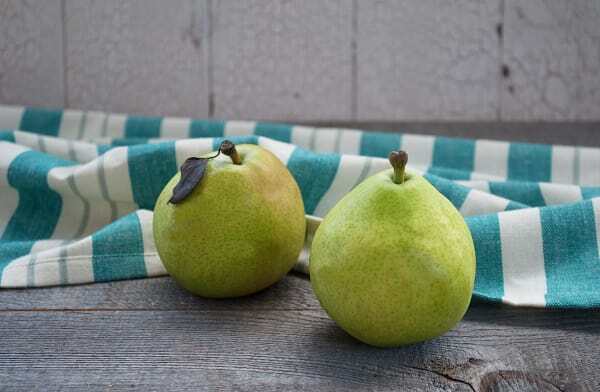 This mild flavored, almost spicy pear has skin a deep shade of green at harvest that becomes lighter, flecked with yellow when carefully ripened. Danjou pear is a salad pear and best when eaten fresh. This pear has abundant juice when ripe and has a sweet mellow flavour. Ripen at room temperature until they yield to gentle pressure. This product traveled 400 km to reach our warehouse. Storage Tip: Unripe pears can be stored in the fridge where they will ripen although much more slowly than at room temperature. To ripen your pears faster, put them in a bag with an apple or banana. Did you know... Pears are a very healthy first fruit for babies because few babies are allergic to them. Culinary Compatibility: Cranberries, ginger, raisins, dates, goats cheese, Parmesan cheese. Health Information: The skin of a pear is the most nutritious part because it contains lots of fibre. Pears contain pectin which helps control cholesterol. Pears are a good source of boron, which reduces osteoporosis. The current growing season means that best of these items are grown organically in Washington right now. Due to weather conditions and general availability, this week's selection is coming from multiple farms within the area.